My attempts to automate PMDO have thrown up a spare 20” mirror. Rather than pack it away or sell it on I have attempted to make a 20” portable goto scope!!! Well as it turned out is not particularly portable but does now have small wheels to allow it to be move from storage to its observing site. As I was just making use of a spare mirror I didn’t want to spend too much on the scope. 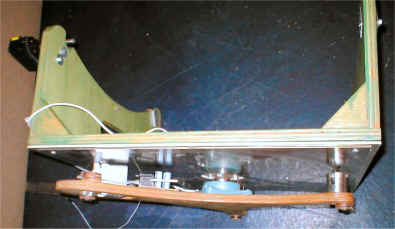 The basic structure is ¾ inch ply 75mm aluminum angle holding the secondary up. The oversized side bearings give a good gear reduction for the drive as well as providing more structural rigidity. 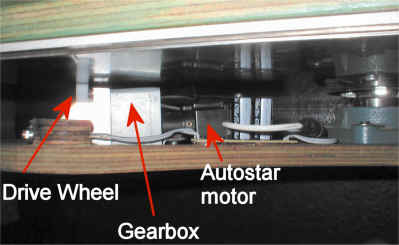 Inside the rocker box is a 18 point cell on 3 spring loaded collimation bolts. A red dot finder is used on the secondary cage and focus is by a JMI 2” Crayford. Drive. 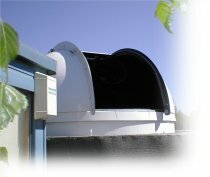 The slightly innovative part of the scope is the drive. While I would like to take the credit of this fellow Norwich Astronomer and machinist Arthur did much of the tricky work. 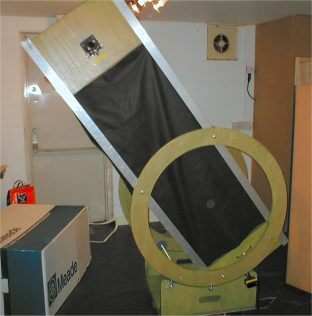 The motors and controller come from a Meade 4504 scope This is a 41/2 reflector on a GEM mount. The little motors surprisingly have enough power to move the 20” Dob around with few problems. The side bearings are covered with stainless steel and driven by a stainless steel roller. This allows for great no clutch operation. If the goto is too slow, grab the scope and move it to the object you are after. 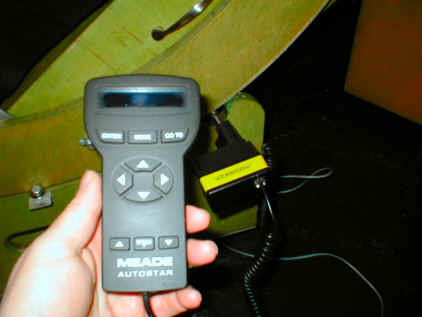 Then tell autostar where its now pointing and it picks up the tracking again. The Azimuth drive is though a conical wheel. As this drives round in a circle it needs to be conical else the inside and outside edges would attempt to drive a different rate. The wheel is in fact a section of a cone whose point is at the centre on the rocker bottom plate. Finding suitable materials for these bearings was more difficult. Ended up with nylon wheel on stainless steel plate. 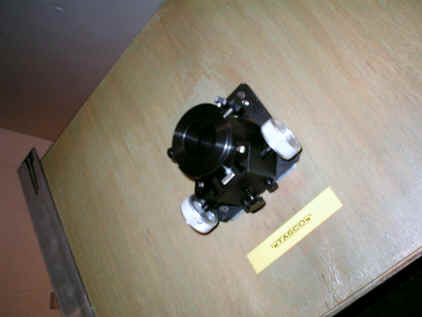 Again this has enough friction to drive while acting as its own clutch for manual slewing.